Klawgor is a Mechanical Bakugan that combines with Cyborg Helios or Helios MK2 to form Maxus Helios or Maxus Helios MK2. 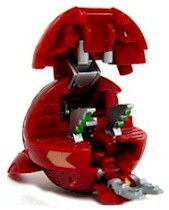 Although small, this Bakugan opens up into multiple layers with attack hardware. Its two spider-like legs have deadly spikes covering them. A tail launches fire blasts from its duel blaster tail. Sharp pinchers help Klawgor to weaken its foes before destroying its opponents with a deadly blow from its tail. Purchase Klawgor from Amazon now!